I think I make the case a bit more clearly here. Still haven’t got the hang of composing Blogger text on this browser, so apologise for presentation issues. Besides, some of the old MySpace posts referred to the evils of saturated fat, which was the fashion at the time, and I cannot be bothered to change that now. Generating this hypothesis has been like dropping a pebble in a pond, where every ripple has uncovered a confirmation so far. It would be nice to test it with some contradictory data. Here is a really good discussion of fructose by a biochemist and “hard science” low-carb pioneer. Fructose is preferentially turned to glycogen on a low-carb diet. Fruit was included in all the pre-Atkins “Eat Fat to Grow Slim” diets (of which there were a few; Mackarness, Barry Groves, Pendleton, Donaldson, just off the top of my head), in limited but useful amounts. Those 1950s thru 1960s diets were effective and popular. A plum, for example, contains a mixture of sugars and starch, in a small serving. Hepatitis C exploits lipogenesis, hepatic TG synthesis and expression as well as LDL uptake, I think that’s pretty clear. It might use gluconeogenesis as well, as it probably has sugar somewhere in its structure, but the lipid is central to it getting out and about. Hep B is different and what you say may well apply to that; hep B doesn’t have the same relationship to cholesterol as HCV. However, other factors such as fatty liver indicate a need to watch carbs with HBV. HCV exploits our misunderstandings about cholesterol; this may be why it’s so prevalent at this point in history. It may be that different HCV genotypes evolved to exploit certain population weaknesses, so that some benefit more from lipid profiles seen in low-protein malnutrition as in the developing world, others from high-carb low-fat malnutrition as in the west. But they all depend on TG and VLDL, so far as I know. has a lot of interesting facts attached. Last time I counted carbs I averaged 240 g/day, and that was having as little as possible and still feeling good. But you say I only really need 150 g? I weigh 230 lbs. Or is that only if I eat more fat to feed the muscles? Or maybe as Mark Sisson says my fat burning machinery needs practice. If you are an athlete, then 240 g/day may be a minimum; it’s certainly perfectly normal. If you are sedentary, then 150 g/day will be enough for outstanding health, although some people may prefer higher carb. if your preferred sugar of choice is sucrose, it may be worth trying Coconut Palm Sugar. Which from what i can tell is 70-79% sucrose, but has a better nutritional profile than good old table sugar. Hi I’ve eaten the SAD diet most of my life, in the past few years doing intermittent fasting. I’ve been feeling unwell the past few months, so I’ve been attempting your diet. I get a shaky feeling, anxiety, sleepiness, depression and dizziness after eating a typical Phd meal, or any meal with carbs in it. I finally realized that I feel a lot better eating close to 0 carbs. What could be causing this? I intend to make a drs appointment, I just want to research some possible ideas before I go. I’ve never eaten such a low carb diet and as I see you don’t recommend it I’m concerned. Thank you in advance for any input. Some extra information: I’ve been on 4 separate weeks of antibiotics these past 2 years. I’ve taken probiotics and made kefir but haven’t noticed improvement. Gut dysbiosis causes it. Gut microbes can only feed on carbs in the oxygen-free environment of the gut. So a zero-carb diet starves them and gets them into a hibernating state which doesn’t generate symptoms. Get a stool test to try to see what pathogens you have – eg Metametrix Microbial Ecology profile. Try reading our bowel disease category. Something strange happened yesterday. I seem to have developed a mildly itchy rash, on my face and inner wrists. I’m not sure if it was from being outside in the heat (if thats even possible?) Or if its related to my extremely low carb diet? Could be oxidative stress depleting arachidonic acid. You might try upping your anti-oxidants, and upping your carbs. Try dextrose or rice syrup, they may be digested upstream of your pathogens and not feed them much. Carbs would do you good. Ok the rash went away thanks Paul. I also have a few other health problems. I have to eat regular meals, if not I get shaky and dizzy but my blood sugar looks ok every time I’ve checked it, I used to be an avid coffee drinker then about a year ago coffee began giving me panic attacks. Also, I tried coconut oil and for the first few days I felt wonderful and could think quicker than usual, then I started getting panic attacks from that as well 🙁 Do you think this is all related to gut dysbiosis? Or caused by something else? My doctor ordered the stool test so hopefully I find out soon what’s going on there. Also I forgot to add I tried stopping the intermittent fasting and eating three meals I day and I just felt worse, unless they’re extremely low carb meals. Congratulations on the book deal! I can’t wait to get my hands on the book when it’s out. I want to thank you for posting information on side effects of low carb diets (hypothyroid, high cholesterol levels and fertility issues). It has helped me immensely. 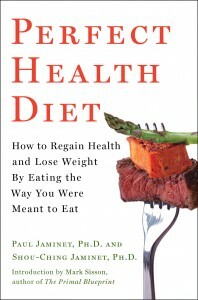 I noticed that other paleo health writers very rarely touch on the subject – aside from Anthony Colpo and Chris Masterjohn. I was a fan of Taubes and low-carb paleo for 6 months until it bought me sudden chest pains, shortness of breath and high cholesterol levels. My thyroid levels seemed okay, but I was constantly cold, dizzy, had pounding palpitations and had trouble sleeping – I’m only 26 by the way. Prior to the low carb diet, I’ve never ever had those symptoms before, so when they suddenly showed after a few months on the diet, I thought I was dying. I’ve been to cardiologist, taken numerous blood tests, x-rays, ultrasounds and more, luckily it wasn’t my heart. So the doctors thought I had anxiety, so I went to psychologist and testing showed I was normal and not suffering from anxiety or hypochondria. After all that, I was at my wit’s end. I continued the low carb diet for 7 more months, not realising that it was causing me to have high cholesterol. It wasn’t until I stumbled onto your blog (and Anthony Colpo’s) that’s when it all fell into place. Turns out it was low carb that caused me to have borderline hypothyroid symptoms (feeling cold, low libido, high cholesterol), low blood sugar (which caused the dizziness and poor memory), and despite eating more fruits and vegies my heart was having palpitations and chest pains probably caused by mineral excretion (low magnesium/potassium/selenium levels?) The chest pains were bothersome enough that I thought I was having a heart attack – I kept going to emergency! I read your post on the hypothyroidism. Although my blood test showed that my thyroid hormones were more elevated than previous years, my doctor wasn’t concerned. Since I started eating more carbs (potatoes, sweet potatoes, taros, rice) I feel SO much better. Even though I ate liver while on low carb, I now eat pate every day, plus Brazil nuts and the chest pains have mostly gone – thanks Paul! I hope the chest pains will completely go away soon. Anthony Colpo also mentioned other side effects other paleo dieter’s have had, namely: cramps, lethargy, bad breath, constipation, and menstrual irregularities, cardiomyopathy, panic attacks, nausea/vomiting, bruising, diarrhea, hyponatremia, hepatitis, kidney stones, and severe vitamin and mineral deficiencies. Some studies have showed that ketogenic diets have even caused cardiac fatalities! When I read that, it really really scared me. Thank goodness I caught it early before I continued to damage myself. Thank you for writing posts like these and being unbiased about the side effects. I still believe paleo/ancestral diets are awesome, but with higher carbs added is probably safer for most people. I noticed a few others who were on low card diets also had dizziness, brain fog and cold body temp when they were on low carb too – it goes away when I make them eat roast potatoes lol. I’m glad you’re better! Congratulations! Anyone know if there are any human studies/research on whether Sucrose consumption lowers ACTH (the main pituitary stress hormone)…or human studies/research on whether Fructose consumption lowers ACTH. 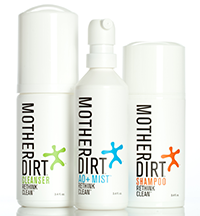 which had no effect on ACTH in humans. Hi Paul, and happy Thanksgiving! I just read Mario’s update and I want to make sure I understand. I’m still working on getting my temps up (I run 97 degrees usually), but I have Hashimoto’s. Right now I’m at a pound of rice/sweet potatoes daily. Would increasing my carbs help raise my temp, or would it worsen the antibodies and/or produce rT3? Also I usually have 5 T butter daily — would it help if I decreased that? Thanks for your help! No, I think that’s a good level of carbs to eat. Eating more carbs might raise your temperature slightly but I don’t think it will improve your health. You could achieve the same by taking slightly more thyroid hormone (if you are on it). 5 tbsp a day of butter is a lot. You would probably do better to swap some of it out for more nourishing fat sources like egg yolks. You want to have a normal ratio of phospholipids to triglycerides in your dietary fats and butter is mostly triglycerides. 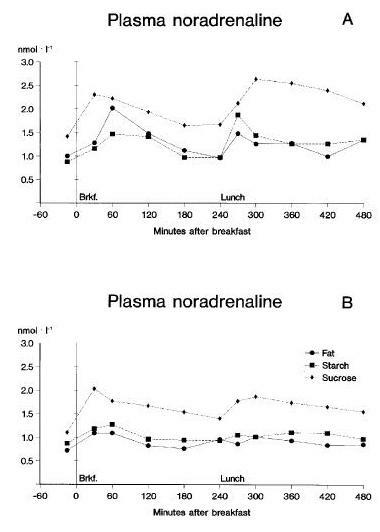 I’ve noticed that one thing is missing from the discussion on Ray Peat’s carbohydrate intake recommendations and it is an important one that has a bearing on the discussion about carbohydrate’s role in stimulating the undesireable release of adrenaline. Peat advocates orange juice as a source of carbohydrate but he also advocates adding sea salt (1/2 tsp or more) to it to counteract maladaptive stress responses including adrenaline release. 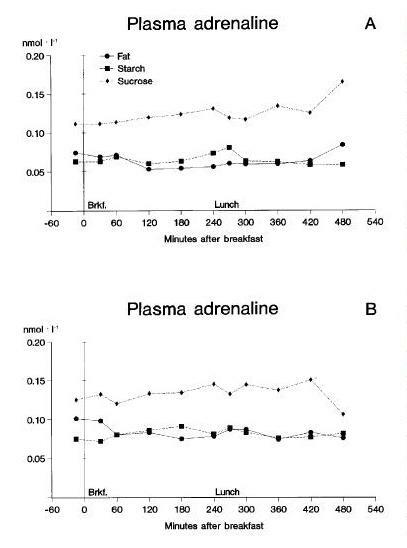 I think this is an important distinction — it is entirely plausible that the addition of salt in this manner would produce adrenaline and noradrenaline profiles that look different from the Raben study profiles. He also suggests eating 1oz of cheese as a source of protein in conjunction with the orange juice. I’ve taken my orange juice in this way for years – the salt enhances the flavour. Ray Peat also suggests eating thyroid pills like after-dinner mints, and does so while on his bizarre diet. A very nice man, but with very strange, and almost absurd dietary advice. His point is that through traditional diets humans would have consumed small amounts of thryoid hormone daily through consumption of organ meats and unpasturised dairy so it’s not so strange when viewed from that perspective. He’s also a PHD endocrine physiologist so while you might believe his dietary advice to be strange he has credentials that doubtless you don’t. You may also have assumed I follow a Peatatarian diet – I don’t but I am familiar enough with his recommendations to know that something important has been overlooked – call me a pedant if you wish but he’s clearly cognisant of the fact that carbohydrate can elevate adrenaline and has a strategy via the addition of sea salt to address it which in the context of the discussion above might just be important to recognize. Yes, thanks Paula for letting us know about that recommendation. Ray’s advice is fairly esoteric and this is a great example. Hi Paul so you do not recommend low carb diet and high fat for someone who want to get pregnant? I am askin cause bulletproof diet suggest high fat diet even for fertility and pregnancy. What is your suggestion? Isn´t ketones diet harmul for baby? Can it cross placenta so baby does not have enough glucose for development? I read another reader’s comments about how easily she bruised before starting the PhD diet and now was not suffering that problem so much. I had the same problem. If I hit my hands or arms, I would have horrific bruises, like a haemorrhaging under the skin. Very nasty looking. This was happening a lot. I have hit myself quite hard accidentally twice this week and there is not a mark. I am amazed. Something in the diet, or something I have eliminated, has obviously reversed this effect. The longer I continue on the PhD program, the better I feel and obviously lots of things are happening “under the surface!” Thanks again. That’s terrific, Sarah! Thanks for letting me know. Now that I have taken the time to really read your articles carefully, I think you are excellent. You are far more reasonable and knolwedgeable than “gurus” such as Anthony Colpo, CarbSane etc. You are “Feynmanesque” in the care that you give to carefully analyze something. Still puzzled about how to count my carbs. I use that Cron-o-meter site. It tallies your grams of carbs and draws a pie chart of your day’s calories that shows what percent are from carbs, fat, and protein. But the carbs figure includes fiber, starch, and sugars. I thought you only counted starches so I’ve been excluding the grams of Sugar and Fiber carbs. Someone at the FB page said no, PHD includes carbs from fruits, too. So should I add the sugars and starch grams, multiply by 4 to get a carb calorie count, and divide by the day’s total calories to find out what percent carbs I eat? It matters to me because I’ve been gaining weight fairly rapidly since late 2012. Nothing that used to work works any more. yep, sugars are included if you are counting carbs. Just exclude fibre. Paul does talk about not counting a certain % of the carbs in non-sugary vegetables due to the ‘overhead’ of energy required for consumption. But i would just rely on the carb number you get from cronometer (minus the fibre). In reality, there is not many carbs in non-sugary vegetables anyway. What could be your confusion is that sugar is Not a safe starch…but it is still a carbohydrate. Yes, that is a confusion. If you had a food/bev with other types of sugar—for example, ice cream or beer—would you exclude those sugar carbs? For the purposes of calculating what percent carbs is in your daily intake? > Do not exclude any carbs (except fibre). Basically if you are getting calories form something, it counts. …Basically if you are getting calories from something, it counts. My understanding is, that it counts for calories, but not for carbs für glycolysis. Carbs for glycolysis should come frome safe starches (100g daily), the rest to the 150g daily can come from other carb sources. At a daily 2000 cal. basis. Jepps, Thank you so much; that is it, of course. I went back re-read again what Paul has said and thankfully figured out how to “count.” I just can’t use the websites like Cron-o and others to do my PHD math for me. 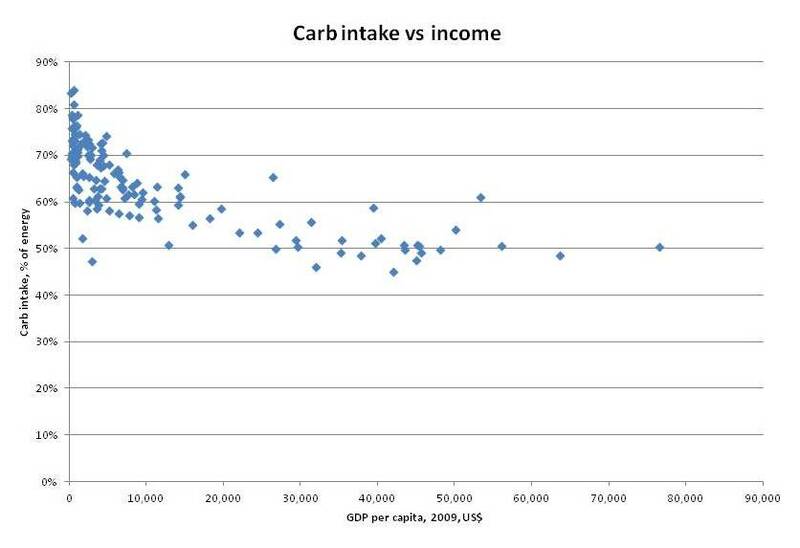 Just out of curiosity, do you have the data for protein and fat intake versus income? I just wanted to say that my experience falls in line with the data posted here about adrenaline. I have always used myself as a guinea pig and decided to temporarily switch from the PHD to a Peat-style diet. All of my carbs have been coming from a combination of fruit juice and milk for the last week or so. For the last few days, I have felt extremely edgy and hypoglycemic even though my blood sugar is totally normal. Eating sugar actually makes the feeling worse. I feel like my adrenaline is shooting out 24/7 and have been unable to sleep since embarking on this adventure. I am switching back to the PHD diet tonight to see if my nerves calm down. I feel pretty awful. Hope you feel better soon Brian. When all of my carbohydrates come from safe starches, my blood glucose spikes to about 150-160 mg/dl (pre-diabetic levels) and stays there for hours. When all of my carbohydrates come from sugar, my blood glucose spikes to maybe 100 mg/dl at most and is back to fasting levels within 45 minutes. My fasting glucose averages about 85 mg/dl on this diet. I have a supercharged amount of energy some days. Though, some days I don’t feel as good as I would like to, I feel the best I have felt since I was 18. When I was eating the Perfect Health Diet, I had major problems digesting the starch. Even a few bites of white rice or potato and my stomach would be bloated to the point at which I couldn’t fit anymore food in there. I must have a bacterial problem. Every day I push through with the Peat-inspired way of eating I feel more and more like my younger self from 10-15 years ago. This may not work for everyone and I am not here to hate on the Perfect Health Diet. It is just what works for me so far. I was wondering , do you count net carb or total carb in the daily 400-600 carb calories ?would that be 100-150g net carb or total? Also, for someone who eats 3 meals a day, would you recommend fruit in the morning or afternoon? And lastly , I tried IF,but I really have to have my cup of coffee at 5am when I wake up, usually with a little half and half snd a teaspoon of honey. Then I’ll have breakfast at 8 lunch at 12:30, dinner at 5. Is that still IF or I’m totally blowing it? That is supposed to be net carbs. … Paul has said in the past that carbs are in general better later in the day, so I’d guess fruits are a better snack between lunch and dinner than between breakfast and lunch, but I doubt it makes that much of a difference. … I’m not sure about the IF — I don’t think 1 tsp of honey is that much; how much half and half is “a little”? — but I would have black coffee in the morning and nothing else until breakfast if I were you. I did the Peat diet for several months. I kept switching back and forth between that and the PHD at first. I finally settled on the high-sugar intake because it made me feel good at first. There is a confounding variable here of an overdose on vitamin D. My vitamin D levels ended up at 142 ng/ml which is just below the toxic cut off on the blood test. I had several massive panic attacks after taking extra vitamin D recently to the point at which I thought I was going to die. I stopped the D and added some A to counteract it. But, this did not completely quell the anxiety. I think this is a combination of the two. Both too much D and too much fructose. I noticed that my pulse had gone from about 75-80 bpm on the PHD to 96-100 on the sugar. I couldn’t figure out why. I didn’t notice more adrenaline at the time. But, maybe I just wasn’t aware of it until it overwhelmed the system. My electrolyte, including calcium oddly, were all normal. My liver enzymes are slightly elevated which may be due to the fructose I consumed over the last few months. I have switched back to the PHD in the hopes of calming my system down. I agree with Paul. Sucrose massively increases adrenaline and if you are naturally anxious and prone to panic attacks, it will cause major issues. I have finally come to the conclusion that Peat is just plain wrong. May I ask how you changed your diet when you did the Peat diet?